In an interview with Le TEMPS (a Swiss Newspaper) Raphael Mayoraz, The cantonal geologist of Valais (a Swiss canton) takes notes of the damages caused to the mountain during the hot month of July: 5 degrees warmer than the 1960 to 1990 average. He sees them even accelerating. According to the World Glacier Monitoring Service of the University of Zurich, from 2001 till now the melting rates two to three times faster than during the entire twentieth century. In Valais, the 680 glaciers retreat five to thirty meters a year. At the same time, the thickness of their ice shrank fifty centimeters to one meter. The permafrost took a huge hit this summer and will continue to melt until winter due to the granite temperature inertia, even if it is really freezing during August. For the mountaineers also this season is very special. 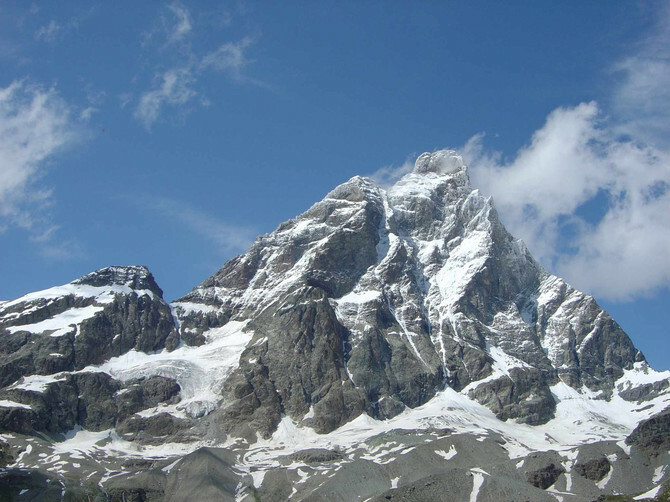 On July 27, a fifty cubic meters stone block crashed on the Italian path of the Matterhorn. 25 climbers were prisoners in a hut at 3800 meters above sea level and have been forced to get to the Swiss side. The mayor of Valtournenche then decided to close access to the mountain, the melting of ice cementing the stone blocks making them unstable. On Mont Blanc, the Saint-Gervais Municipality closed the Goûter hut on July 19, before discreetly reopening it on July 31 and closing it again. Most of the guides avoiding the climb to Mont-Blanc by the normal way anyway. “This sweltering summer is causing a lot of damages: you see as I do that the mountain is very dry and rockfall and / or landslide are numerous. 2 days ago, I was in the “French Direct” on the north face of the Comb Needle (Aiguille du Peigne) in the Red Needles (Aiguilles Rouges), to remind myself of the normal way that we wanted to climb with a group on​​ August 16. Ludovic Ravanel (a Chamonix specialist on permafrost) has indicated that before the Drus collapsed, the warning signs were the same. “Personally, after this serious warning sign or whatever you want to call them I will no longer set a foot in the mountains this summer, except on ultra compact and less than vertical pillars, or outside the permafrost zone.